The first edition of this book was published under the title of Thomas Aquinas: An Evangelical Appraisal in 1991 by Baker Book House (ISBN: 978-0801038440) and republished in 2003 with the same title by Wipf & Stock Publishers (ISBN: 978-1592441549). Printed versions (softcover) of the 2003 unrevised edition may be purchased from WipfandStock.com. This 2013 version is a light but complete revision of all chapters accomplished by Dr. Geisler in 2013. Most importantly this version adds two completely new chapters—one on evil and one on the origin, nature, and destiny of human beings. In addition, it updates the bibliography with some of the most important recent works by and on Aquinas. 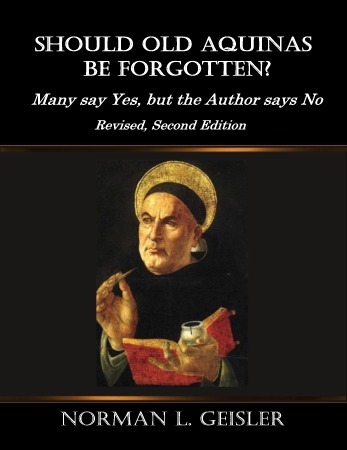 This is still the only complete work on Aquinas by an evangelical Scholar available in print today. Previous PostThe Roots of EvilNext PostShould Believers Make Ashes of Themselves?